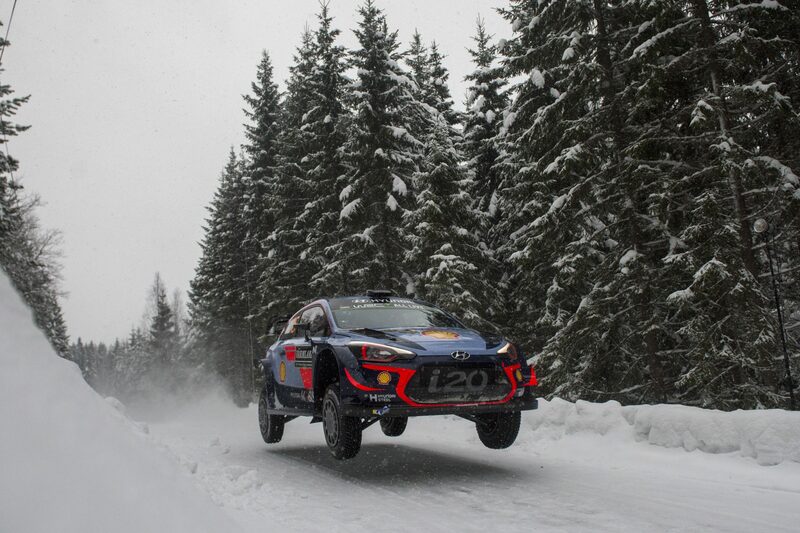 THIERRY Neuville headed a clean sweep of the top three places for Hyundai at Rally Sweden following Friday’s first full day. The Belgian fended off Andreas Mikkelsen by 4.9sec after a tough day on snow and ice-covered roads in the forests of Sweden and Norway. Hayden Paddon surged up the order late on to claim third, 12.1sec off the lead. Lying sixth after Thursday’s curtain-raising speed test, Neuville moved his i20 to the front on Friday morning’s second stage and held off a chasing pack which had the advantage of better conditions. The early starters lost time ploughing a clean route though fresh morning snow. They endured worse when the tests were repeated in the afternoon, battling ruts and narrow tramlines created by later competitors in the original pass. Conditions improved with every car but a determined Neuville held on, even though he never had the luxury of a lead greater than 4.8sec. “Fifth on the road was OK and I could benefit from the lines of the guys in front and push hard to match those behind. When I saw the afternoon conditions I knew we’d struggle, but sometimes we were able to go faster than those starting after us to stay ahead,” he said. Paddon won two afternoon stages to leap from eighth at the midpoint, claiming his second success in the final Torsby stage despite fearing he had overworked his studded tyres. The Kiwi’s charge deprived Craig Breen of a top-three place, but the Irishman was delighted with his form. He also won two afternoon stages and was 0.5sec further back, with Mads Østberg completing a thrilling fight for third 0.6sec behind. Teemu Suninen was sixth, despite the light pod of his Ford Fiesta flying off in the final test with fellow Finn Esapekka Lappi seventh. Lappi was second before burying his Toyota Yaris in the snow ,which blocked the radiator grille and sapped engine power. Team-mates Jari-Matti Latvala and Ott Tänak suffered badly from their start position and were eighth and ninth, with Kris Meeke completing the top 10. A despondent Sebastien Ogier fared worst of all. The championship leader opened the road and conceded almost three minutes en route to 12th. Saturday’s route journeys east of the rally’s Torsby hub and features two identical loops of three stages, which include the famous Colin’s Crest jump. It ends with a second pass through last night’s Karlstad trotting track test and a sprint on the edge of Torsby. The eight stages cover 120.31km.